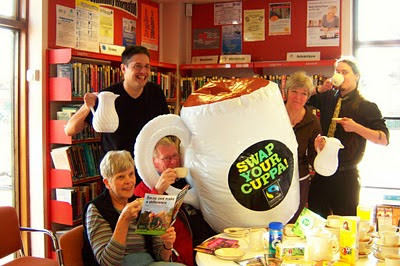 As part of Fairtrade Fortnight a ‘Taste the difference’ Tea Morning was held at Kent Elms Library. Customers and staff had the chance to try Fairtrade coffee, tea and biscuits. They were also given a copy of the new local Fairtrade Directory of local retailers that stock or serve Fairtrade items in the Borough of Southend. A big thank-you to Peter and his team at Kent Elms for supporting the event. South East Essex College, Carnarvon Road, Southend recently proved their commitment to their Fairtrade College status. During the recent Fairtrade Fortnight during the last week of February first week of March students learnt about Fairtrade and it's importance during their weekly tutorials. Tutor David Watt said. "This equated to around 10,000 students developing their knowledge of this worthy cause, that encourages to change our shopping habits and look for products with the Fairtrade mark." A coffee morning is being held at Holy Trinity Church, Southchurch Boulevard, on Wednesday, April 21, from 10an to noon. There will be a Fairtrade stall at the morning to raise funds for the church. Fairtrade Fortnight proved to be a busy fortnight at Southend High School for Boys, Prittlewell Chase, Southend. Fairtrade chocolate sales raised £380 and thirty boys took part in a chocolate treasure hunt organised by Joe Palmer and Lewis Saville in their Lower 6th. The staff took part in a Fairtrade wine Tasting session – the wine being kindly supplied free by The Co-operative Membership. “Out of the Earth” florist shop supplied a beautiful table decoration for this event. Based in Southchurch Road, Southend, they are able to provide Fairtrade flowers in arrangements. The Big Swap competition was won by Tom Cerson 9st2, who managed to persuade his parents to purchase Fairtrade products in the supermarkets over the fortnight. A huge thank you in advance goes to the SHSB Parents Association who have agreed to serve Fairtrade drinks at future concerts and will be raffling a Fairtrade hamper at the forthcoming Spring Concert on 30th March. Report by J Halsall – RS Department, SHSB. ‘Hair’ on the Leigh Road, Leigh - the first Salon to join our ‘Fair Cut’ campaign has been showcase by the Fairtrade Foundation on their website and in their newsletter Fair Comment. This has been sent to thousands of supporters across the UK. Pupils from Heycroft Primary School, Eastwood were visited by David Elcock a volunteer from the Southend Fairtrade Borough Campaign. The assembly explained to the children about Fairtrade and the topic of what is 'fair' and what is un-fair'. The children watched a video of the 'Invasion of the Tea Ladies' which showed campaigners for Fairtrade dancing around parliament and Trafalgar Square dressed as Fairtrade Tea Ladies to raise awareness of the cause. They also discovered how how shopping habits can make a positive difference to poorer people all around the world if we choose items with the Fairtrade Mark. If you are a local school - why don't you do the same? Leigh Road Baptist Church, Leigh-on-Sea has long been a supporter of Fairtrade. It was instrumental in setting up and leading in the Leigh-on-Sea's campaign to become a Fairtrade Town, forming a steering group of volunteers from the local community. On the middle Sunday of Fairtrade Fortnight, church attendees learnt about the importance of Fairtrade in helping the some 2 billion people in our world that live on less that $2 a day. They learnt that as shoppers choosing products with the Fairtrade Mark can make the all the difference to families around the world. The service was followed by a cup of fresh Fairtrade Coffee or Tea for all who attended. Over 150 cups were served. It was four years ago that the Marguerite Drive church commited itself to becoming a Fairtrade Church. This means that it uses Fairtrade mark Tea, Coffee & Sugar in all it's meetings and gatherings. That it commits to helping raising awareness of the Mark and to prays for the Fairtrade cause that benefits the world's poorist producers. Indeed they encourage other places of worship to join and support the cause. More details can be found at http://www.fairtrade.org.uk/ and click on here for on how to register the support of your place of worship. To celebrate the Big Swap theme of this year’s Fairtrade Fortnight, the Worshipful the Mayor of Southend is embarking on a fund-raising groceries heist. Councillor Brian Smith, posed as one of the infamous Blues (Brews) Brothers, and undertook a Fairtrade trolley dash at 4.30pm on Sunday 28th February at The Co-operative Food Store, Sutton Road, Southend. Racing against the clock, he filled his trolley with as many Fairtrade products as he could grab – in aid of the Mayor’s Charity Fund. Afterwards he was joined by fellow ‘Brews Brother’ - Assistant Manager of the The Co-operative Food, Paul Kennard, to recover with a giant inflatable cup of Fairtrade tea. Councillor Smith says: “I very much enjoyed this fun event which will boosted two excellent causes at the same time – the Fairtrade issue, and the charity I have nominated during my Mayoral year – the Sycamore Fund for Southend’s Young Carers." Fairtrade is well established at Belfair's High School and various projects will be taking place this Fairtrade Fortnight. 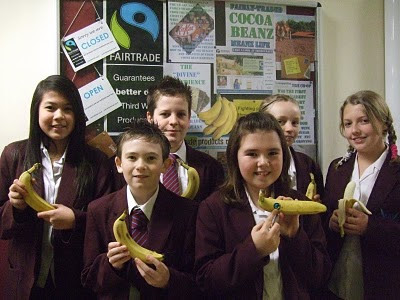 The picture above shows Year 7 students enjoying Fairtrade bananas in front of this year’s hall display. “We highlight Fairtrade Fortnight on the school website,” said Community Projects Co-ordinator Jan Andrews, “and run a series of Fairtrade assemblies for one week – this year we shall be concentrating on fairly traded cocoa beans. The emphasis will be on the chocolate manufacturers who are only buying fairly traded cocoa beans – and providing training for their farmers to improve the quality and quantity of their harvests year on year. "We will also be highlighting “The Big Swap” – the Fairtrade Foundation is urging everyone to just change one of their usual choice of a drink or foodstuff – for a FAIRTRADE one." For more information on The Big Swap visit www.belfairs.southend.sch.uk.